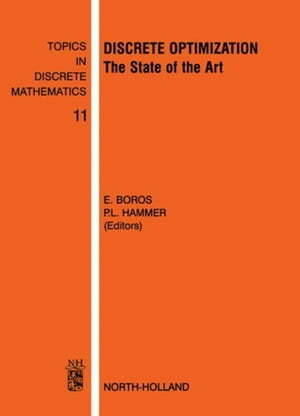 Collins Booksellers - Discrete Optimization: The State of the Art by Boros, E., 9780080930282. Buy this book online. One of the most frequently occurring types of optimization problems involves decision variables which have to take integer values. From a practical point of view, such problems occur in countless areas of management, engineering, administration, etc., and include such problems as location of plants or warehouses, scheduling of aircraft, cutting raw materials to prescribed dimensions, design of computer chips, increasing reliability or capacity of networks, etc. This is the class of problems known in the professional literature as "discrete optimization" problems. While these problems are of enormous applicability, they present many challenges from a computational point of view. This volume is an update on the impressive progress achieved by mathematicians, operations researchers, and computer scientists in solving discrete optimization problems of very large sizes. The surveys in this volume present a comprehensive overview of the state of the art in discrete optimization and are written by the most prominent researchers from all over the world. This volume describes the tremendous progress in discrete optimization achieved in the last 20 years since the publication of Discrete Optimization '77, Annals of Discrete Mathematics, volumes 4 and 5, 1979 (Elsevier). It contains surveys of the state of the art written by the most prominent researchers in the field from all over the world, and covers topics like neighborhood search techniques, lift and project for mixed 0-1 programming, pseudo-Boolean optimization, scheduling and assignment problems, production planning, location, bin packing, cutting planes, vehicle routing, and applications to graph theory, mechanics, chip design, etc. • theoretical, computational and applied aspects.